A previously healthy 10 year-old male presents with one day of RLQ pain and vomiting. He awoke earlier that morning with mild to moderate pain, ate oatmeal for breakfast, and then vomited twice. About one hour later, he was sitting at his desk at school when he suddenly developed more severe abdominal pain. He initially presented to his pediatrician’s office, and was subsequently referred to Hasbro Children’s Hospital Emergency Department. No known sick contacts and no recent travel outside Rhode Island. No prior surgeries. He denies fever, chills, respiratory symptoms, melena or hematochezia, diarrhea, or urinary symptoms. On exam, BP 115/71, HR 80, Temp 98.5F, RR 20, SpO2 99%. He is ill-appearing and acutely distressed. He has RLQ tenderness to palpation and involuntary guarding. He has normal testicular lie without tenderness, edema or erythema. Lab studies notable for WBC 7.9, blood glucose 114. Abdominal/appendiceal ultrasound was ordered and showed an enteroenteric intussusception in the RLQ with adjacent inflammation and free fluid concerning for possible focal perforation (Figure 1). Figure 1. “Crescent in a donut” sign. Transverse view of intestinal intussusception. The hyperechoic crescent is formed by mesentery that has been dragged into the intussusception. Intussusception occurs when a part of the bowel invaginates into itself, causing venous and lymphatic congestion. Untreated, intussusception may lead to ischemia and perforation. Intussusception most commonly occurs in infants and toddlers ages 6 to 36 months-old, and approximately 80 percent of cases occur in children younger than 2 years-old . Classically, parents report 15-20 minute episodes, during which their child seems acutely distressed, characterized by vomiting, inconsolable crying, and curling the legs close to the abdomen in apparent pain. They may also describe a “normal period” between episodes or offer a history that includes grossly bloody stools. 75 percent of cases of intussusception in young children have no clear trigger. Some evidence suggests that viral illness plays a role, particularly enteric adenovirus, which is thought to stimulate GI tract lymphatic tissue, in turn causing Peyer’s patches in the terminal ileum to hypertrophy and act as lead points for intussusception . Approximately 10 percent of intussusceptions occur in children older than 5 years . Unlike their younger counterparts, these patients tend to present atypically, with pathologic lead points that triggered the event . The patient described above illustrates this well. At 10 years-old, he presented with peritonitis after his intussusception caused focal perforation, and had no prior history of colicky abdominal pain or bloody stools. Ultimately, he was found to have Meckel’s diverticulum. This is the most common lead point among children, but other causes include polyps, small bowel lymphoma, and vascular malformations . 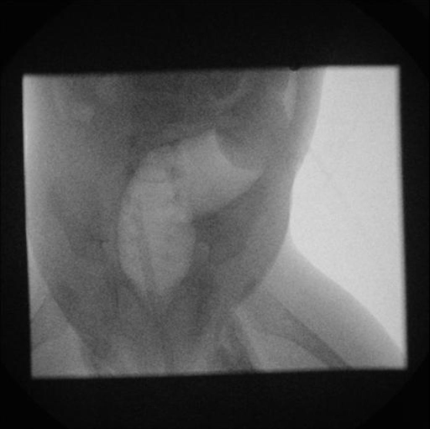 Plain abdominal radiographs are not sufficient to rule out intussusception, but they can be useful to exclude perforation and ensure that non-operative reduction by enema is safe. Some signs of intussusception on abdominal x-ray include an elongated soft tissue mass (classically in the right upper quadrant as in Figure 2) and/or an absence of gas is the distal collapsed bowel, consistent with bowel obstruction. The optimal diagnostic test for intussusception depends on the patient’s presentation. When infants or toddlers present classically with intermittent severe abdominal pain and no signs of peritonitis, air or contrast enema is the study of choice because it is both diagnostic and therapeutic (Figure 3). When the diagnosis is unclear, however, abdominal ultrasound is preferred. Ultrasound has been shown to be 97.9% sensitive and 97.8% specific for diagnosing ileocolic intussusception, and is increasingly becoming the initial diagnostic study of choice at some institutions [6,7]. In addition to the ultrasound finding of “crescent in a donut” shown above, other sonographic signs of intussusception include the “target sign” (Figure 4) and the “pseudokidney sign” (Figure 5). Without clinical or radiographic signs of perforation, non-operative reduction is first-line treatment. Operative intervention is indicated when the patient is acutely ill, has a lead point needing resection, or the intussusception is in a location unlikely to respond to non-surgical management. For example, small bowel intussusceptions are less likely than ileocolic intussusceptions to respond to non-operative techniques . The patient was taken emergently to the OR, where he underwent exploratory laparoscopy with laparoscopic appendectomy and resection of a Meckel’s diverticulum. No intussusception was noted intraoperatively. He recovered well, and was discharged home two days later. Meckel’s diverticulum is the most common congenital anomaly of the GI tract. It is a true diverticulum (meaning it contains all layers of the abdominal wall) that is a persistent remnant of the omphalomesenteric duct, which connects the midgut to the yolk sac of the fetus. The “rule of twos” is the classic mnemonic to recall some other important features: it occurs in approximately 2% of the population; the male-to-female ratio is 2:1; it most often occurs within 2 feet the ileocecal valve; it is approximately 2 inches in size; and 2-4% of patients will develop complications related to Meckel’s diverticulum (such as intussusception), usually before age 2 . Consider intussusception in older patients. While it is less likely, approximately 10% of cases occur in patients over 5 years old. In older patients, suspect pathological lead points, such as Meckel’s diverticulum, as potential etiologies of intussusception. Obtain an abdominal x-ray before performing diagnostic/therapeutic enema to rule out perforation. Ultrasound is the preferred test when the diagnosis is uncertain. Patients with small bowel intussusceptions or known lead points are less likely to respond to non-operative reduction. Patients who are acutely ill-appearing require surgery as first-line treatment. Sagar, Jayesh, Vikas Kumar, and D. K. Shah. "Meckel's diverticulum: a systematic review." Journal of the Royal Society of Medicine 99, no. 10 (2006): 501-505.